This article contains useful instructions on how to use the BigBlueButton video conferencing application. Note that in order to join a session and use BigBlueButton, Flash must be enabled on your device. 1. Open the Moodle that contains the conference that you need to join. Click on the BigBlueButton link. In the top left corner of the BigBlueButton window, there are two buttons that can be used to connect audio and/or video to the conference. 1. 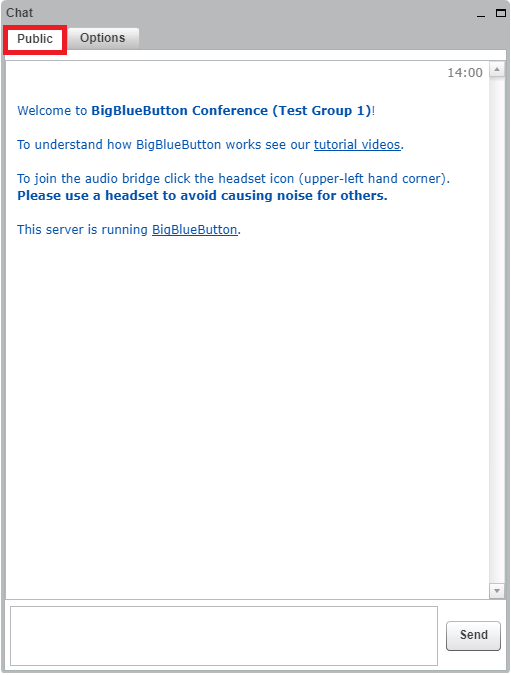 After clicking Join Session, a prompt will appear in the BigBlueButton window asking "How do you want to join audio?" Select Microphone if you wish to enable it. 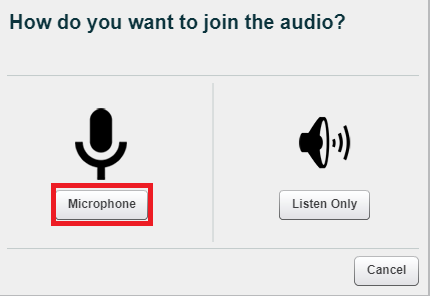 Note: If you wish enable/disable the microphone after you have entered the conference, click the Share Your Microphone button at the top left of the window. If you have a compatible headset, then clicking the button will instantly allow other people in the conference to hear your audio. 2. To connect video, click the Share My Webcam button at the top left of the window (to the right of the Share Your Microphone button). Note: You may need to allow your browser to access your webcam first. 3. A Webcam Settings window will appear. 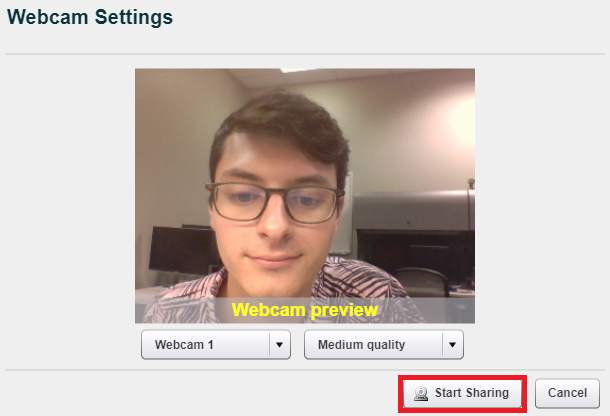 Select the desired webcam and quality, then click the Start Sharing button to continue. 1. Select the Share my Screen button at the top left corner of the screen. 2. 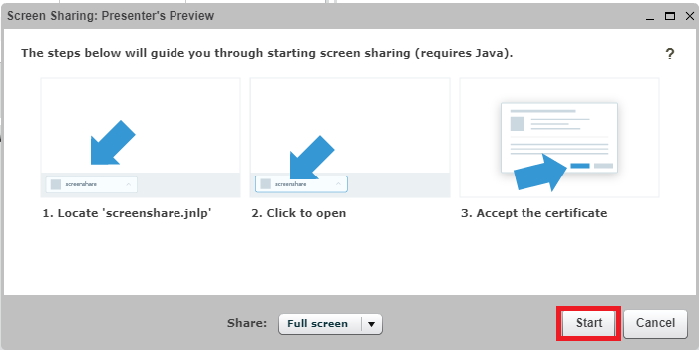 The Screen Sharing: Presenter's Preview window will appear with three steps to follow to start screen sharing. Click Start and follow the three steps to begin sharing your screen. Note: This feature requires Java. Chatting in the conference is done using the chat menu in the top right corner of the window. 1. To chat with the entire conference, see that the tab labeled "Public" is selected. Then enter text into the box and click Send. 2. To chat with a specific person, click the "Options" tab and select an individual from the provided list. 1. 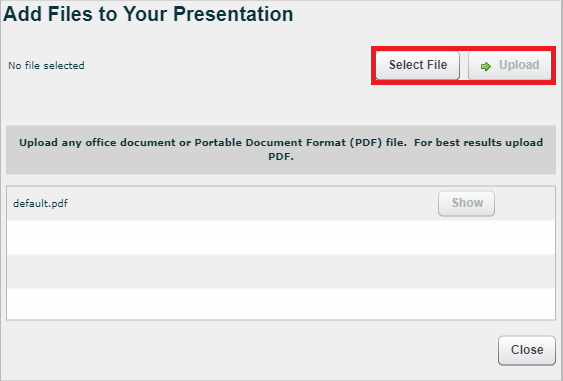 To add a file to the presentation window, click the Upload File button at the bottom of the window. 2. In the Add Files to Your Presentation window, click "Select File." After choosing a file, click "Upload." 3. The file will be displayed in the presentation window where it can be edited and discussed with the conference. Being the moderator of the conference allows you to change the person who is presenting. To do so, use the Users menu in the top left corner of the window. Hover your cursor over the name of the person you wish to make presenter and then click the "Click to Make Presenter" button.